Madan Lal Udhouram Sharma pronunciation (Punjabi ??? ?? ?, Hindi ??? ??? and Urdu ??? ??? ??? ??? ???? ) 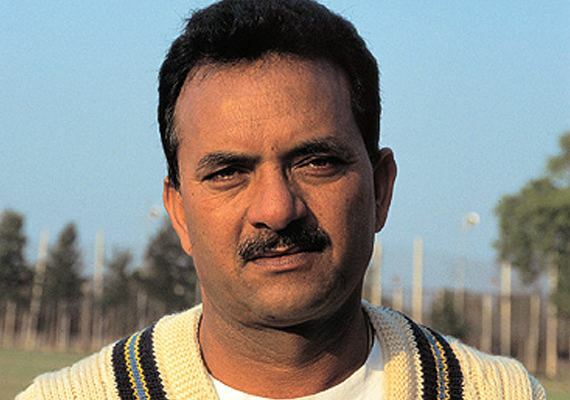 born 20 March 1951 in Amritsar, Punjab is a former Indian cricketer (1974–1987) and Indian national cricket coach. He is born in a Brahmin family. He coached Delhi Giants in the Indian Cricket League. Madan Lal bowled the first ball to Dennis Amiss of England in the 1975 World Cup He made 67 One Day Internationals appearances and was also a member of the 1983 World Cup final winning team where he teamed up with Kapil Dev, Balwinder Sandhu, Roger Binny, Mohinder Amarnath and Kirti Azad to contain and destroy the opposition.In the 1983 world cup finale Kapil Dev took the extraordinary catch of Vivian Richards off the bowling of Madan Lal. Madan Lal played for Punjab but later played for Delhi. He was member of the Selection Committee from 2000 and 2001. He joined and served as the coach of the Delhi Giants (known as the Delhi Jets till 2008) in the Indian Cricket League till it became defunct. He later applied for BCCIs amnesty offer since the ICL is not a recognized Twenty20 League. In March 2009, the Indian National Congress decided to field Madan Lal as their candidate for the Hamirpur Parliamentary constituency bye elections in Himachal Pradesh. Madan Lal was chosen to contest the bye elections against Anurag Thakur, son of the Himachal Pradesh BJP leader, Prem Kumar Dhumal. In April 2013, Madan Lal came on a crime show called Hum Ne Li Hai- Shapath on Life OK at 9pm.